Students in Queen Roshae's Hair Matters class, which is held inside of a mobile salon. Queen Roshae shows a group of girls onto the mobile salon bus. They giggle and whisper as they climb aboard, one by one plopping seats on a long bench. School’s out and they’ve come to the Central Community House to wait for their parents to get off work. Roshae runs Napps, Kinx & BBs natural hair salon on Westerville Road. Styling hair wasn’t her plan as a kid, but she’s glad that’s how she makes her living. Now that Roshae knows the business, she wants to teach the next generation of black kids how to turn hair into a career. 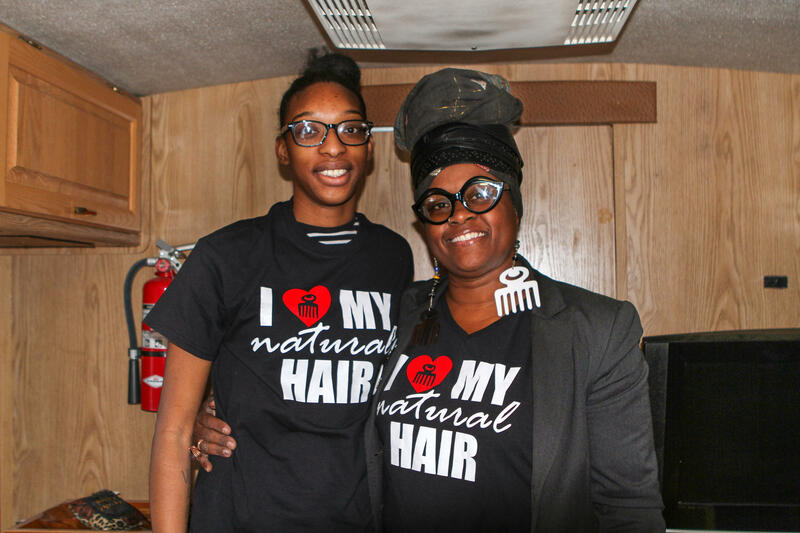 She bought an old bus for $1,000 and turned it into a mobile salon, taking her Hair Matters classes where they’re needed most. Natural hair licenses are still relatively rare in Ohio: the state issued just 62 licenses between 1999 and 2014. Because the licenses require 450 hours of training, stylists often worked off the books or got a lower state certification known as a boutique services registration, which became available in 2016. But the law allowing those registrations is only in effect until April 5. 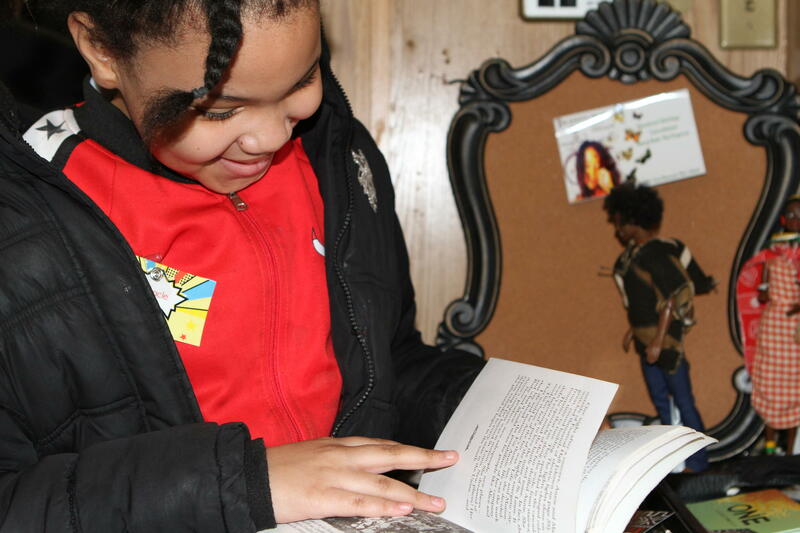 Zyarah Evans, 10, comes to the Central Community House every day after school. She loves to do hair. “When I was little I used to play with my hair a lot," Evans says. "I used to try to do it. I used to put stuff in my hair." She knows she has a lot to learn if she wants to style other people’s hair. “I just now need to learn how to like start the braids off and how to knot it when I’m finished, and all type of different things,” Evans says. Queen Roshae, right, stands with her former student Slim who now helps with the Hair Matters classes. Evans is among the elementary and middle school girls Roshae will teach to do hair over this spring and summer. Beyond lessons, though, Roshae also wants to provide mentorship to the girls. Not everyone is set on the path, though. One girl who declined to be interviewed said she wanted to be a doctor. Roshae’s expertise may be hair, but she wants to empower young girls to follow dreams of all kinds. "I'll Bring The Barber To You"
Roshae has already helped 20 others get their natural hair license. That includes Paiden Williams, 19, who goes by the name Slim. She now volunteers for the Hair Matters bus. “Actually being able to get in there and see the way the business is ran, the way the money flows, see the way the service is supposed to be, all the things you need to produce a good business to brand,” Slim says. Slim has used her license for freelance hair gigs all around the state. She wants to join Roshae in empowering other girls to do the same. Miracle, a student at the Hair Matters mobile salon, reads a book about hair. Roshae is expanding the training opportunity to others who may not be able to afford it. The whole process of obtaining a natural hair license can cost over $1,000. “We created a scholarship initiative," Roshae says. "So for every shampoo assistant tuition-paid, which is about $1,200. That’s their kit and everything included, like t-shirts and field trips." For every person who pays for a natural hair license through Napps Academy, Roshae will pay for two kids to get their license. She wants to focus on kids who are aging out of the foster care system and need a skillset. A Columbus Foundation grant funds the effort with Central Community House. Arts programmer Katerina Harris says this will help black kids form connections with professionals who look like them. Roshae hopes the bus’ mobility will be fun for young mentees, but also a way to help people who struggle to find transportation. Roshae also plans to partner with the Urban League in the future. She hopes to take the bus to other area programs and community events, and eventually across state lines. As Queen Roshae preps for an intimate, 10-hour hair session with a client, the stylist breaks out into her theme song. "I'm a soul sista, knocking those naps up on their backs!" Roshae sings. "Oh, baby, come see me!" At the Daddy Daughter Hair Factory, it's O.K. if you know nothing about hair. None of the men here do. But they're all eager to learn. A U.S. Hair & Beauty employee rapidly scans the barcodes of the latest shipment of hair extensions. Black, burgundy and chestnut brown weaves pile up on the floor as she throws one pack down to pick up another. U.S. Hair & Beauty is the biggest beauty supply business in Columbus, at seven stores and growing. Sitting in one of the half-dozen chairs at Holy Moses in Grandview Heights, R.J. Trimber is getting a trim. "My hair eight months ago looked nothing like this," he says, as barber Garrett Woerndle makes his way around Trimber with an electric razor.